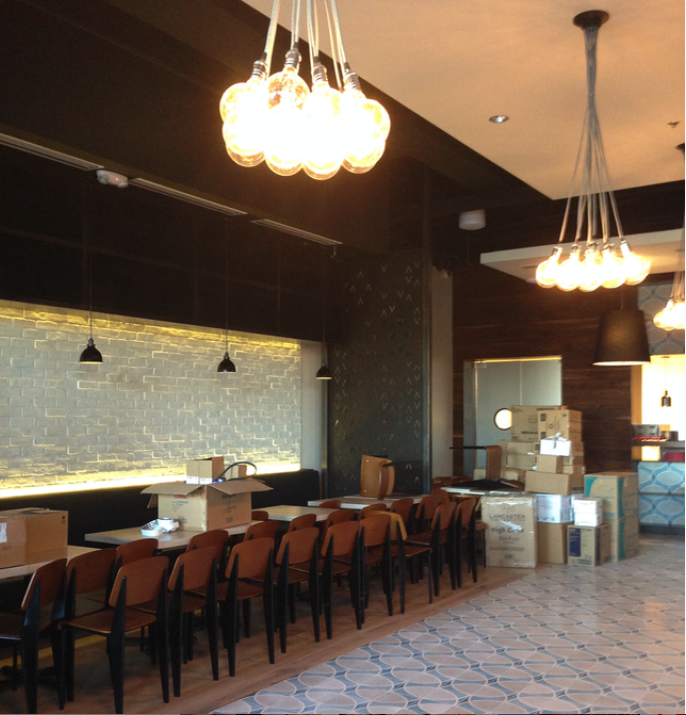 A sneak peek at the new Cava Mezze that’s opening mid December in Olney! Ignore the stacks of boxes, they’re still unpacking. Ever since walking by the freshly painted brick and the new “Cava Mezze” sign on my daily Starbucks run in Olney, I’ve been wondering when it will be opening… you might have even caught me salivating as I passed by. Wait, did I say that? Shh…. Some of us might be familiar with Cava’s fast-casual version, AKA Cava Grill, with locations in Bethesda, Kentlands, DC etc. 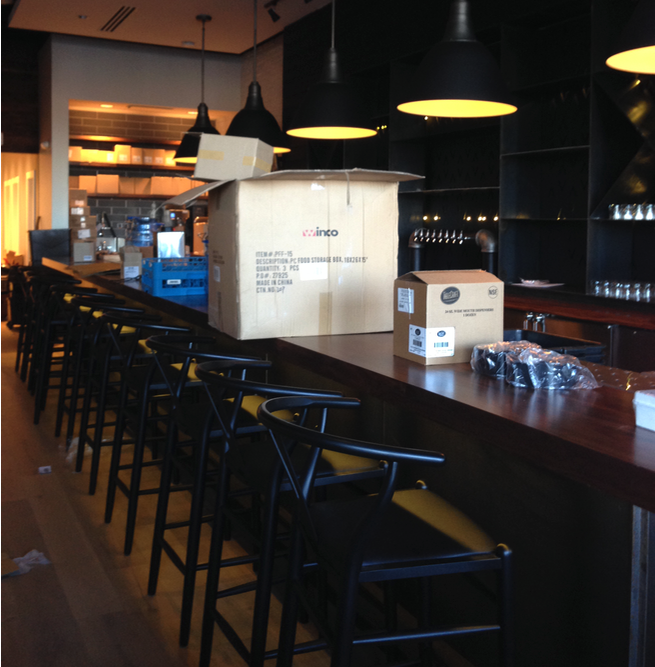 But Olney, don’t you worry… we get the nicer, swankier full-service version of Cava: Cava Mezze. Today I had the awesome luck of meeting two of the guys responsible for opening the new Cava Mezze in Olney – George and Andreas. They let me get a sneak peak of the place… and let me tell you I was pleasantly surprised… it had gorgeous light fixtures, beautiful tile and wood floors, glossy brick walls and a very inviting full-service bar. But after looking around some more, I could imagine myself there for happy hour or a nice long lunch or a cozy dinner. … And I could definitely picture a few certain co-workers, we won’t name names, saddling up to the bar pretty regularly. They are affable local guys that have been building, together with the three founders, the Cava business from the beginning. In fact they are very local… George went to Sherwood High School and Andreas grew up in Colesville but his parents moved to Olney 15 years ago. In fact, they told me that Cava, when they were first starting out, was trying to come to Olney 9 years ago near the current Cheeburger Cheeburger. As for exactly when they’re opening, George told me that they will likely have a friends & family opening next weekend and then officially open to the public around the 14th of December. If you’ve been merrily buzzing by and haven’t caught sight of the new Cava yet, it’s in the small Olney shopping center that includes Cafe Rio Mexican Grill, Starbucks and Unleashed by Petco, at 3122 Olney Sandy Spring Road to be precise. 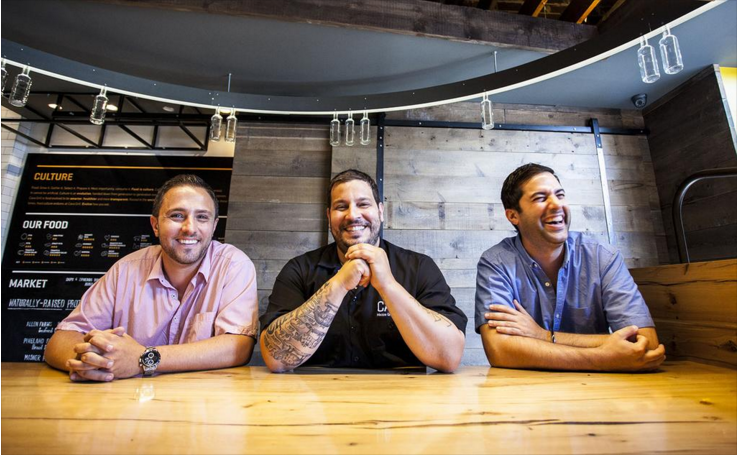 The founders of Cava, Olney local Ted Xenohristos on right. Photo courtesy of Washington Business Journal. 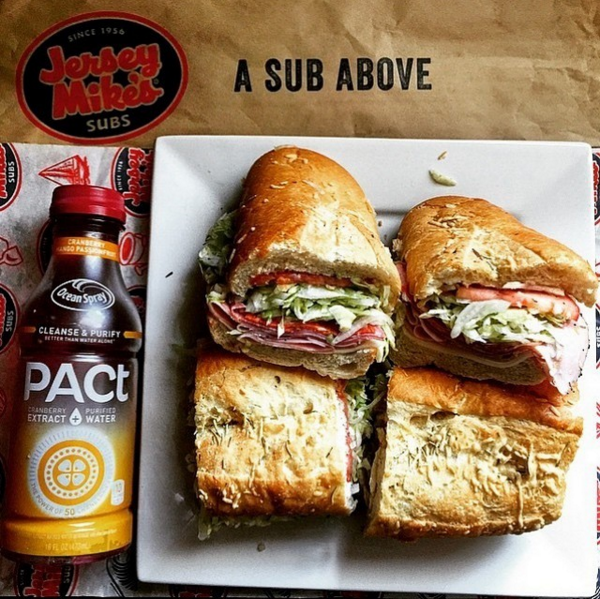 The buzz is out that Jersey Mikes will be opening soon in the Olney Shopping Center. I checked, and Olney is indeed listed as an “Opening Soon” location on the Jersey Mikes website but they don’t specify a date yet, however Snag-a-job’s website has oodles of job listings for Jersey Mikes in Olney. So that’s a good sign. 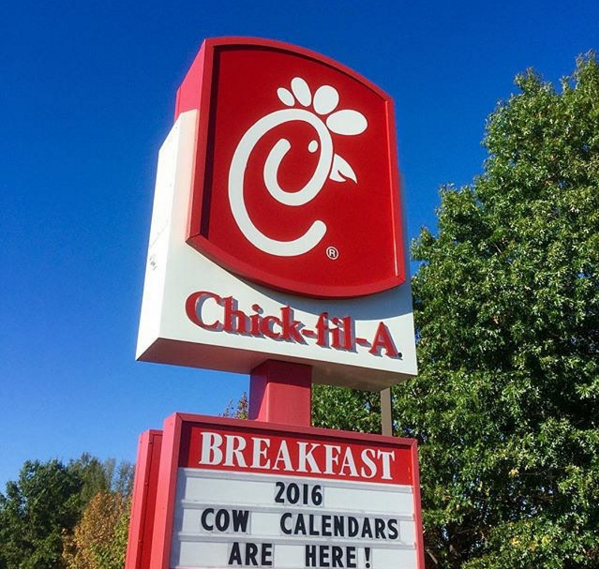 Here’s hoping – for our chicken lovers – that Chick-fil-A sets up shop in Olney in 2016.